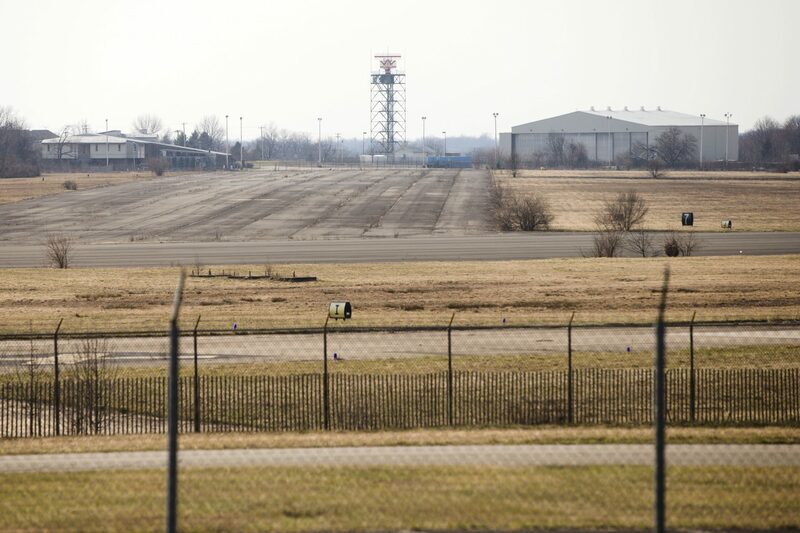 The former Naval Air Station Joint Reserve Base Willow Grove and present day Horsham Air Guard Station is shown Thursday, March 10, 2016, in Horsham, Pa. Two types of perfluorocarbons, which have been linked to health problems, were found nearby at levels exceeding recommended limits set by the Environmental Protection Agency. A federal agency plans new limits on a class of toxic chemicals that are stricter than those issued by the Environmental Protection Agency, and which would cause a “public relations nightmare” if they were published without coordination with other agencies, EPA officials have warned. Perfluorocarbons (PFCs), whose uses once included nonstick cookware and firefighting foams, have been linked to certain cancers, low birth weight in infants, and immune-system problems. They are not regulated by the federal government but are subject to limits by an increasing number of states, including New Jersey. In Pennsylvania, two of the chemicals have been found at levels exceeding EPA guidelines near Warrington in Montgomery County, where the contamination of public and private water supplies has been blamed on the use of firefighting foams at several military bases. National data on PFC contamination were published in 2017 by Northeastern University and Environmental Working Group (EWG), a nonprofit that advocates for stronger regulation of PFCs. Now, internal EPA emails show that the federal Agency for Toxic Substances and Disease Control is planning to publish recommendations that EPA officials warned would fuel public alarm over whether people are being exposed to hazardous levels of the chemicals through drinking water and food. The emails were first published on May 11 by Inside EPA, an independent newsletter that covers the agency, and is seen by the scientific community as an authoritative source. For PFOA, another type of PFC, the ATSDR’s recommended limit is one-seventh of the EPA’s health level, according to an estimate by Inside EPA. “The public, media and Congressional reaction to these new numbers is going to be huge,” an unidentified White House official wrote in an email forwarded to an EPA official. The emails were obtained in mid-April by the Union of Concerned Scientists via a Freedom of Information Act request, said Yogin Kothari, a senior Washington representative for the advocacy group. Kothari said the emails and other documents obtained by UCS are now posted on the organization’s website. One of the emails, also in January, said ATSDR was getting ready to publish draft recommendations for minimal risk levels of four types of PFC in the Federal Register in order to take public comment. While the recommended levels varied widely for children and adults, the public will focus on the lowest levels and find locations where those limits are exceeded, it said. U.S. Rep. Brian Fitzpatrick, a Republican who is seeking re-election this year in the First Congressional district under the state’s redrawn electoral map, called on the EPA to respond to claims by advocates including the UCS that the agency is trying to suppress the ATSDR’s recommendations on the chemicals. Fitzpatrick’s district includes the Warrington and Warminster area where PFC contamination has been found. The EPA responded to Fitzpatrick’s statement by saying that it will seek a “uniform” approach to the chemicals among federal agencies at a summit meeting called by EPA next week. “EPA is eager to participate in and contribute to a coordinated approach so each federal stakeholder, EPA, DOD, and HHS, is fully informed on what the other stakeholders concerns, roles, and expertise can contribute and to ensure that the federal government is responding in a uniform way to our local, state, and Congressional constituents and partners,” the EPA statement said on Tuesday afternoon. The agency earlier said it had contributed to ATSDR’s development of minimal risk levels for the chemicals. EWG said the emails show ATSDR coming under pressure from other government agencies, including EPA, which has rolled back many kinds of environmental protection including limits on emissions from power plants and automobiles under Administrator Scott Pruitt. EWG said it expects the ATSDR’s recommendations on the chemicals will be a prominent and controversial feature of next week’s EPA summit. “The ATSDR study will be the elephant in the room,” at the meeting, the group said in a statement. The nonprofit said EPA has ignored many studies showing that the chemicals are harmful to human health even at very low levels, and urged state and local delegates to next week’s summit to press EPA on that subject. ATSDR, a branch of the Department of Health and Human Services, confirmed that it is preparing to publish a revised “toxicological profile” of four types of PFCs that will include provisional minimum risk levels (MRLs) for the chemicals. An MRL is an estimate of daily human exposure to a chemical that is likely to be without appreciable adverse noncancerous health effects over a specified time period. Responding to questions from StateImpact, the agency did not say whether the recommended levels would differ from those of the EPA or when they would be released. “We are working with the EPA, DoD and other federal partners to provide consistent and proper interpretation of the role of MRLs, and how they should be used and interpreted,” ATSDR said in a statement. In the last four years, growing concern over PFCs has led New Jersey to begin implementing some of the strictest standards in the nation. The chemicals are no longer used in U.S. manufacturing but they persist in some water supplies, and are used in some other countries. This story has been updated with new comments from EPA and EWG.